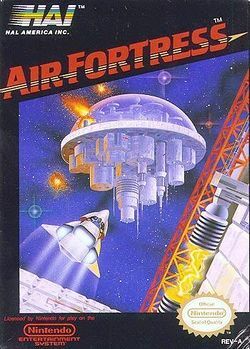 Air Fortress is a game published in Japan for the Famicom in 1987 and later in North America for the NES in 1989. According to a publication by IGN.com only a total of 385 copies of the game were shipped to the United States in 1987, and it is believed that only 20 were shipped before hand as a test run for the system. The game is made up of two parts. Power-ups to increase Energy or Bombs can be found in each part of the game. Additionally, Super-bombs (clear screen of enemies) and Invulnerability can be found while flying the lightship. The first part is a side-scrolling shooter on the surface of the air fortress where you must avoid various flying enemies and try to destroy as many waves as possible. It is similar to many side-scrolling shooters such as Gradius. This lasts until you dock with the airlock. Once docked, you walk the inside of the Air Fortress at your own pace. Hal is equipped with a jetpack along with a blaster weapon and a more powerful bomb weapon. Any movement or firing you do consumes energy which is regenerated by standing still. Your goal is to blow up the core and find the escape ship before explosion. The game play of this portion is seen to be directly inspired by Namco's Baraduke. The people of the planet Farmel, having recently gained the technology for space travel, eagerly explored the galaxy only to find a herd of monstrous "Air Fortresses" moving in their direction. The Fortresses behave like interstellar locusts, consuming all of the resources and living things in their path. The Space Federation sends their mightiest fleet, but they are quickly eliminated by the powerful Fortresses. In a final gambit, they send a single warrior (Hal Bailman), outfitted with a shielded spacesuit, powerful weapons, and small lightship to infiltrate the Fortresses and destroy them from the inside out. This page was last edited on 3 June 2010, at 19:39. This page has been accessed 8,403 times.